One of the strongest instincts in an animal is the will to survive. As a prey animal, horses have a very strong fight-or-flight response and are naturally easily startled. The impulse to outrun whatever has troubled them is usually the first response but, if a horse is trapped, they will endeavour to defend themselves by biting, kicking and rearing. Domesticated horses have grown up in artificial environments and many are accustomed to the everyday hustle and bustle of yards and even working farms with loud machinery. Fireworks are a less frequent and very intense experience, full of sudden and unfamiliar sounds, sights and smells. F: Fireworks should never be set off close to horses and should be pointed in the opposite direction of their fields and stables. 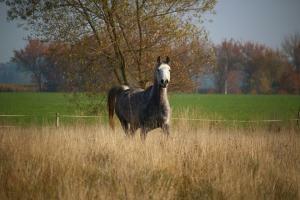 I: Instinct is deep-routed and, when startled, a frightened horse will try to escape whatever it is that threatens them. R: Raise awareness in your local area. Ask to put up posters on notice boards and explain to neighbours and local fireworks organisers the significant effect fireworks can have on horses. E: Examine your stables, yard and fields for anything a startled horse may harm itself on. Check for loose nails, sharp edges in stalls and ensure that all gates, bolts and fences are secure. The last thing you want is your horse to get out and find itself on a public road in a state of panic. W: Warn your local community that you have horses. Work with local farmers to spread the word as livestock will also be affected. Give out your telephone number so that people can contact you if they hear of a display. O: Organisation is key. Know when local displays are going to happen and make sure you have prepared as much as possible: secure fields/stables, consider a desensitisation program in the weeks/months running up to firework season (see principle explained above), speak to a vet if you feel your horse is an extreme case. R: Reassurance. As a herd animal, horses look to their companions (including owners) for reassurance and safety. If you know that your horse gets upset during fireworks, make sure you stay with them and create a light, relaxed atmosphere. When they are tense and restless, speak in gentle and calming tones to soothe them. Never leave a distressed animal alone and if you need to go out during a planned display, ask an experienced person who knows your horse to keep them company. K: Keep their night-time routine as normal as possible. If you usually turn your horse out overnight, leave him out (providing you have checked and secured the field). Stabled horses will be more sheltered from the noise and flashes but in extreme cases have been known to harm themselves or even break free. Some extra bedding around the edges can help to prevent scrapes. Playing music will help disguise the sound of fireworks and turning on the light will reduce the flashes that would otherwise light up the stable and startle your horse. S: Safety! Horses are large, powerful animals with the potential to cause serious damage to you, another horse or themselves even without meaning to. If you horse startles, move out of the way and do not attempt to restrain it. It is best to stand outside a stable door or the other side of a fence during the fireworks, especially if they are restless. A worried horse will move around and feel safer when they can move their feet in response to a stimulus- it is like a preparation for flight while they are waiting for a stronger signal to flee. Always watch for their reactions and stay calm yourself. Respond appropriately to their actions and try to create a positive atmosphere to influence them. There is a huge range of horse calming supplements available, many of which make use of the properties of herbal and natural ingredients. Zylkene Equine Sachets are popular and effectively used to manage short and long-term stress in horses. Casein, the milk protein in Zylkene, acts upon specific receptors in the brain to reduce anxiety and relax horses during stressful events. The sachets are extremely easy to give as the apple flavoured powder is simply mixed into food. During firework season, Zylkene should be given from two days prior to, and on the day of the event. If you would like any further advice, please don't hesitate to contact us.